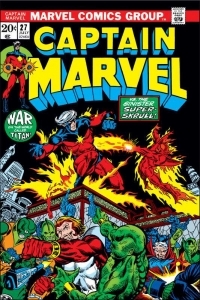 This month we feature a classic bronze-age arc from the pages of Captain Marvel. 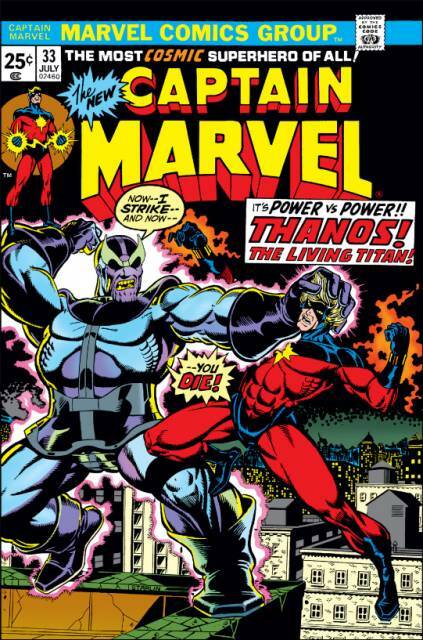 The Captain Marvel #25-34 storyline is the highpoint Marv-ell’s comic career, and introduced us to the full mad cosmic villainy of Thanos. 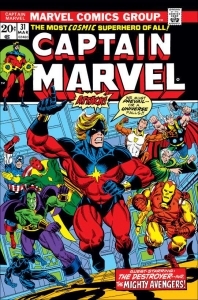 Captain Marvel was first introduced to us in Marvel Super-Heroes #12. He soon had his own book (Captain Marvel #1 May 1968), but the title seemed to lack direction with an uneven series of fits and starts. 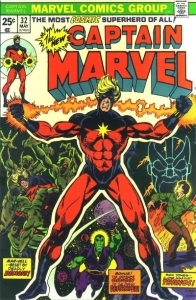 Captain Marvel changed costumes and appearance, added Rick Jones as a support character (Captain Marvel #17), and went on hiatus for six months following Captain Marvel #19. 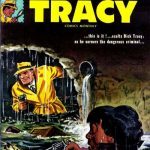 It returned In June 1970 with issue #20 and was published bi-monthly. The title appeared to be on life-support, and the brink of full-time cancellation. 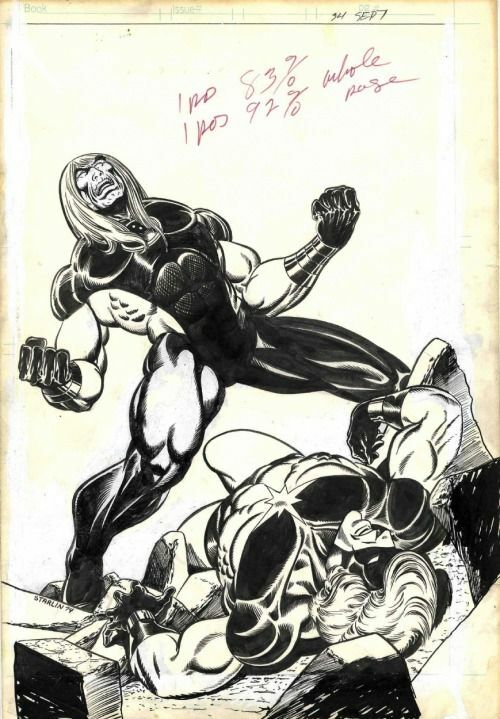 Enter – Jim Starlin. 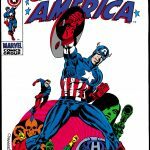 Mr. Starlin started working for Marvel in 1972 fresh from a tour of duty in Vietnam as an aviation photographer. 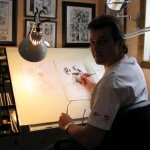 Marvel “Mentored” young Jim well with a series of assignments as an inker (Amazing Spider-Man #113-114) cover artist (Where Monsters Dwell #18 &20, Amazing Adventures #17) interior pencils, and writing chores (Iron Man #53,55,56). These are just some the examples of the work he did prior to taking the reins in Captain Marvel #25. There has been plenty written about Jim Starlin’s creation Thanos and Jack Kirby’s DC character Darkseid, and how close the two appear to be, both in appearance and style. I’ll let you google that and decide for yourself if Thanos is a rip-off. The one thing that has puzzled me about the two characters is the value of their first appearances by Overstreet. Darkseid first appeared In Superman’s Pal Jimmy Olsen #134 (1 panel $750 9.2) second appearance Superman’s Pal Jimmy Olsen #135 (1 page $150 9.2) and the first full appearance in the Forever People #1 ($300 9.2). 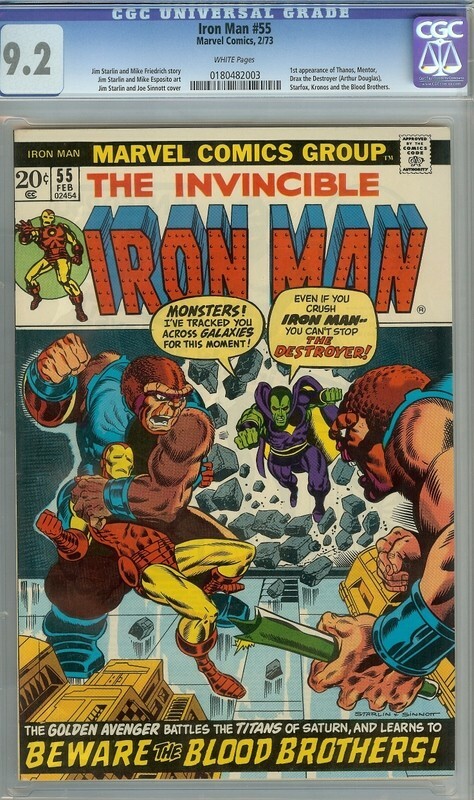 Thanos’ 1st appearance in Iron Man #55 is ($1250 9.2). I am certain I am looking at a group of Undervalued and Overvalued books here I am just not clear on which is which. Pretty sure we have already discussed this somewhere on CBD at length I just can’t remember where. Jim Starlin is penciler of choice on these books with some help from John Romita and the entire Marvel bullpen seems to be on board for the inking chores Joe Sinnott, Al Milgrom, Klaus Jansen, and many others. The writing chores are Mike Friedrich at the beginning, Jim Starlin does most of the rest with some help from the new full time writer Steve Englehart at the end. There are a lot of books to cover here today. I will give the briefest of story synopsis here and factoids about each book. In addition to the Captain Marvel books we have added three unbilled books in the post in chronological order, and we start with one of them right now…. Well we might as well begin with a bang. Jim Starlin starts his cosmic opus here in the pages of Iron Man #55. 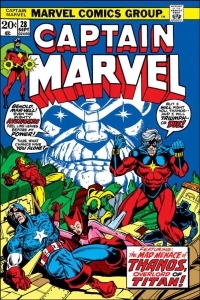 It’s a slam bang book which features the first appearance of Drax the Destroyer, Mentor, the Blood Brothers and Thanos. It is the beginning of the cosmic saga but when you first read it, feels like a one-off. With the help of Isaac the computer and Mentor, Drax the Destroyer and Iron Man team-up to defeat Thanos and his robot look a like, and bond as friends in the process. Drax the Destroyer looks a lot like “The Destroyer” from early golden age Timely comics in appearance, but is apparently no relation. Iron Man #55 is still a pretty hot book, matched only by the Overvalued Iron Man #1 in this title. Iron Man #55 brings a lot to the table in terms of the cosmic saga that will play out in the Avengers in its next two movies. There is a lot to like about this book now and going forward. 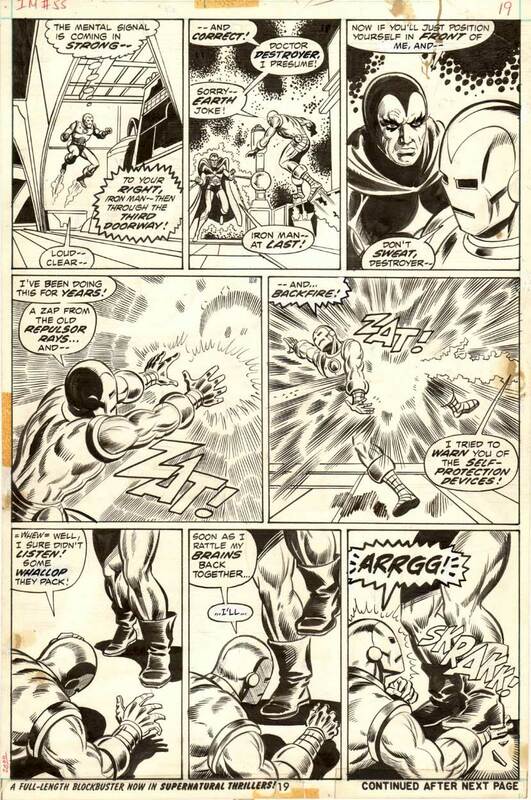 Iron Man issue 55 page 19 by Jim Starlin and Joe Sinnott. Source. 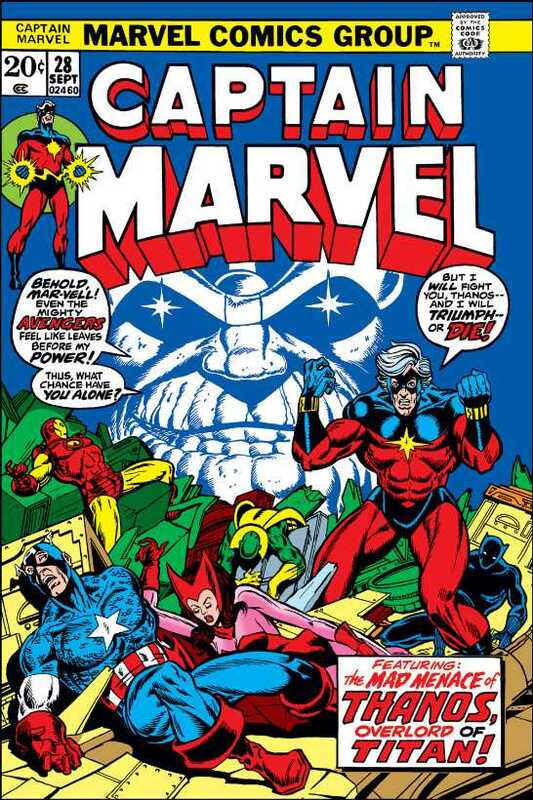 The reins of the faltering Captain Marvel title are handed over to a young Jim Starlin. 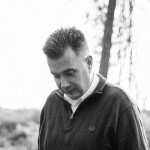 What have you got to lose (insert gag reflex here)? This issue is written by Michael Friedrich and Starlin has the art. The unseen Masterlord sends his thralls the Super Skrull and Kragg on mission called Kree Crusher in attempt to take down Captain Marvel. 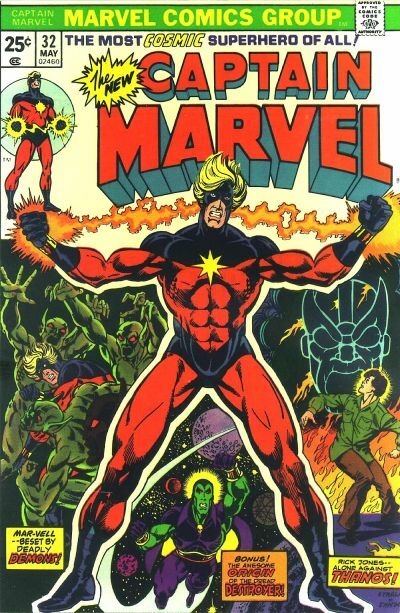 They try breaking young Rick Jones down with a series of images of all of Captain Marvels old foes but fail. The Super Skrull and Kragg return to the Masterlord defeated. I really like Jim Starlin’s art and he can draw muscles like no one’s business as evidenced by the cover work. It looks like he was influenced a bit by Neal Adams. 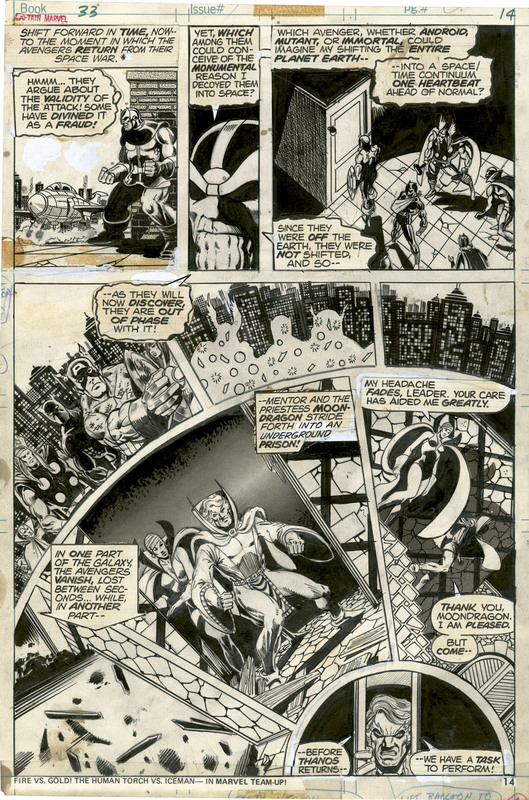 Captain Marvel issue 25 page 17 by Jim Starlin and Chic Stone. Source. We have found out that Thanos of Titan is the Masterlord. Yikes! 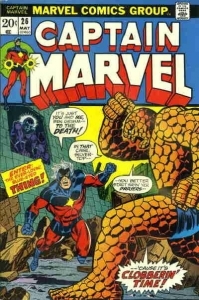 Thanos sends the Super-Skrull to earth and to attack The Fantastic Fours – Thing. The Super-Skrull leads the Thing to Rick Jones apartment and Jones turns back to Captain Marvel via the Nega bands once he spots the Thing. 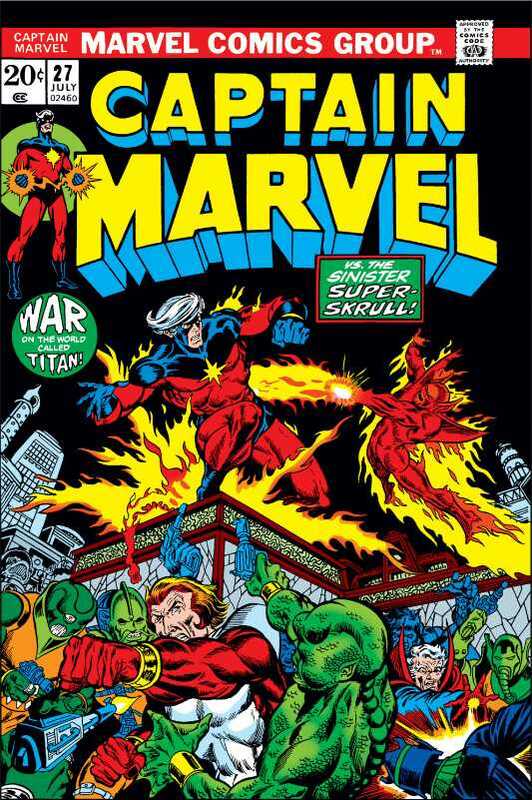 Captain Marvel assumes the Super Skrull has taken the shape of the Thing and the battle is on. 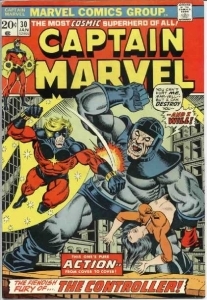 Captain Marvel defeats the Thing and after a little consultation realize the dupe and the two join forces to find the Masterlord. They meet Thanos for the first time. He is all powerful but needs information to become even more so. Captain Marvel assumes it is to come from him. With a wave of Thanos’s hand Captain Marvel is turned into Rick Jones, the actual keeper of the information that Thanos seeks. Not a good time to be Rick Jones as this issue comes to an end. 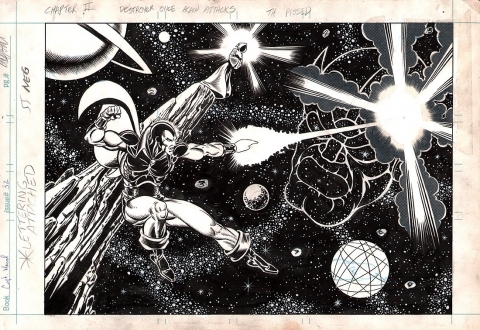 Captain Marvel issue 26 page 22 by Jim Starlin and Dave Cockrum. Source. Rick Jones is attached to a machine called the “Mind Cyclone” by Thanos. It is not a ride at the circus. He uses it to probe the unconscious mind of Rick Jones. In a while he finds what he seeks – the location of the Cosmic Cube on earth. We find out later it was the entity The Supreme Intelligence who placed this information in Rick’s unconscious mind for unknown reasons. No matter- Thanos is on his way. He leaves the Super-Skrull in charge of the facility. A long story short Mentor & Eros team -up with Rick Jones/Captain Marvel to take on Thanos’s thralls and the Super Skrull. A quick flash to Earth and Thanos, who along with his mysterious hooded companion has found the cave that houses the Cosmic Cube. Only problem for Thanos is it is guarded by Drax the Destroyer! 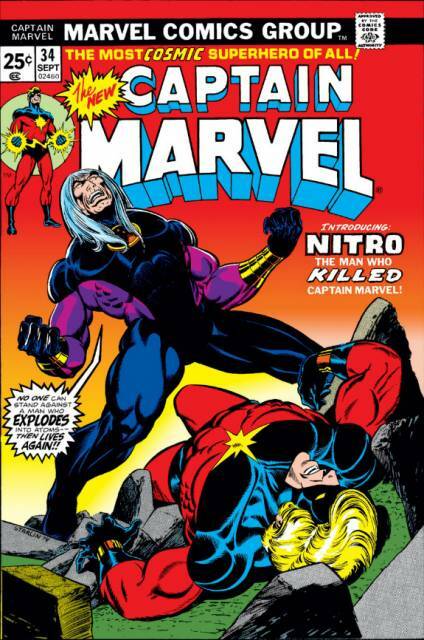 We cut away again back to Thanos HQ and Captain Marvel has won his battle with the Super Skrull and “killed “him. Captain Marvel leaves for earth and Avengers HQ to warn them of the danger and enlist their aid. He arrives to find Rick’s girlfriend Lou-Ann clinging for life. I like the cover, this is a very good and busy book that I have only touched on here. Captain Marvel issue 27 page 12 by Jim Starlin and Pablo Marcos. Source. One of the best books of the run. It is divided in to three chapters. Chapter One has Rick Jones/Captain Marvel at Avengers HQ giving the team the low down on Thanos and his mad quest to control the universe. An intruder arrives at Avengers HQ and quietly begins taking out the Avengers one by one. They are all down except Captain Marvel when he finally reveals himself – It is The Controller (Iron Man #13) under Thanos influence. Chapter Two Drax the Destroyer stands in Thanos’s way protecting the Cosmic Cube. Thanos has had enough, he unleashes a Time-Mind Sync-Warp upon the Destroyer who bravely tries to fight it off. Lots of cool images here. The Destroyer does break free to Thanos’s amazement but is out cold. Thanos has the Cosmic Cube. Chapter Three the Controller has come for the girl Lou-Ann and only Captain Marvel stands in his way. The Controller’s power has amplified to Thor- like levels and Captain Marvel loses his battle in pile of debris. Captain Marvel isn’t under the debris however he has been transported away by Eon and Chaos and they plan on making Mar-vell the antidote to the poison that is Thanos. Great book. I can tell you waiting two months for each these was tough! 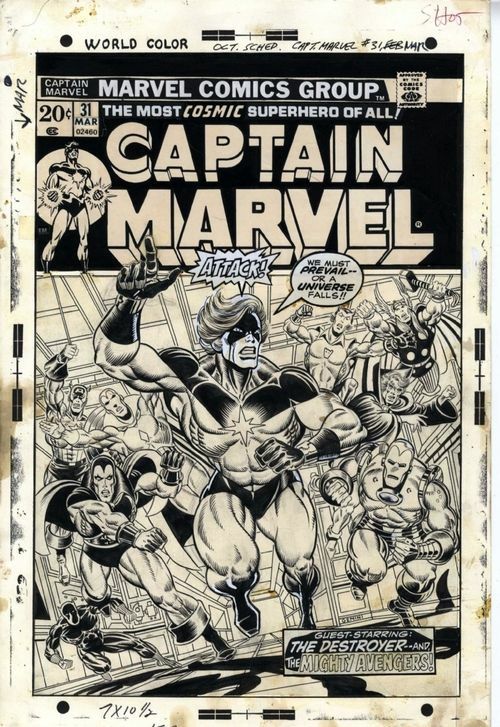 Captain Marvel issue 29 cover by Jim Starlin. Source. Captain Marvel the soldier must die so the universe will live. Eon & Chaos bestow cosmic awareness upon the new Captain Marvel. You get to see all of Captain Marvels life in the process. The art is visual feast. His hair turns from silver to gold (grey to blonde). 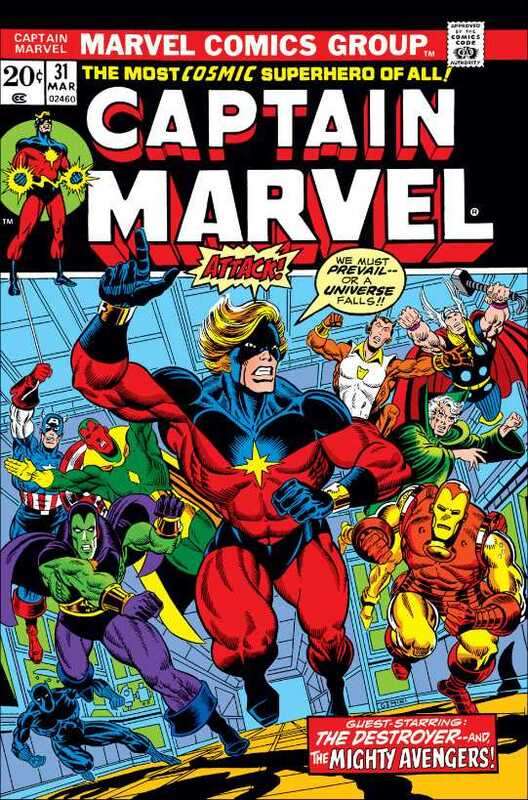 The very cool cover of the book has a John Romita head on the new Captain Marvel, I thought this was unnecessary move. When Captain Marvel joins Rick back at Avengers HQ he is a very changed man. 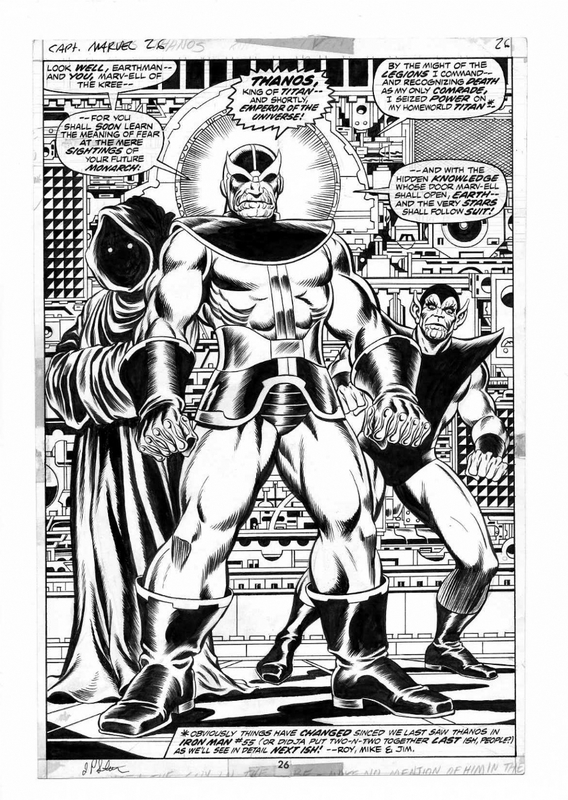 Captain Marvel issue 29 page 26 by Jim Starlin and Al Milgrom. Source. The new Captain Marvel arrives and tells Iron Man that he is responsible for retrieving Lou-Ann from the Controller and sets out to do so. Iron Man leaves on another mission out west. Captain Marvel has a knock-down drag em’ out battle with the Controller. Thanos is not pleased with the result and “kills” the Controller. The good Captain returns Lou-Ann to Rick Jones. The Destroyer arrives at Avengers HQ. The final page has Thanos and his mysterious hooded companion gloating over his new-found power – then there is a sudden change and Thanos claims to have only one wish. We will have to wait a bit to find out what that wish is because we are moving on to our second unbilled issue and Iron Man’s mission out west in…. The Blood Brothers Are Back! 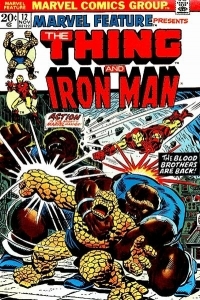 The final issue of Marvel Feature is an Iron Man -Thing team-up. Set in the desert they are up against a tough pair. The Blood Brothers – galactic Vampires Iron Man previously battled in Iron Man #55. A spirited battle follows and the good guys finally get the upper hand. This of course the cue for Thanos to “kill” the Blood Brothers for their failure and presses a button and they vanish into thin air. Iron Man heads back to join the mayhem in Captain Marvel # 31 and the Thing starts his brand-new Marvel Two-In One title. 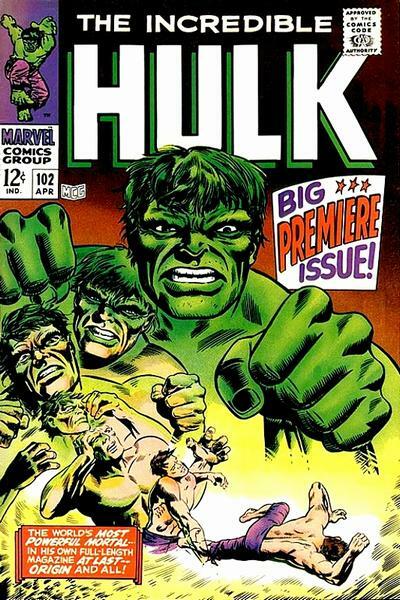 Although this title didn’t produce a lot of high-end collector books, it did run successfully for one hundred issues and seven annuals and in general was a fun read. 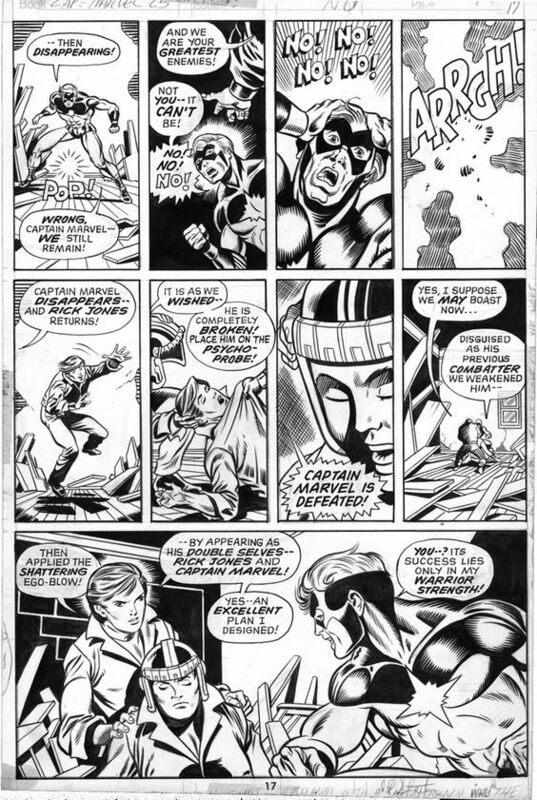 Marvel Feature issue 12 page 18 by Jim Starlin and Joe Sinnott. Source. We begin the final three issues of the Thanos story with a terrific “Charge” cover led by the new Captain Marvel. In addition to the characters on the cover Moon Dragon, Mantis, and the Swordsman have joined the battle. Thanos has signalled out his four must die first heroes for their past interventions in his plans. The unlucky four are Captain Marvel, Iron Man, Drax the Destroyer, and Moon Dragon just because she is from Titan. We finally see Thanos’s hooded companion, she is foxy looking lady whom he claims is the reason he has embarked on his mad quest with the Cosmic Cube. Captain Marvel has just finished a recap of past events when he is transported with the other three unlucky heroes to Thanos’s base. They all put up a strong battle but in the end, they are defeated. Thanos re-appears on the last page as a universal God. 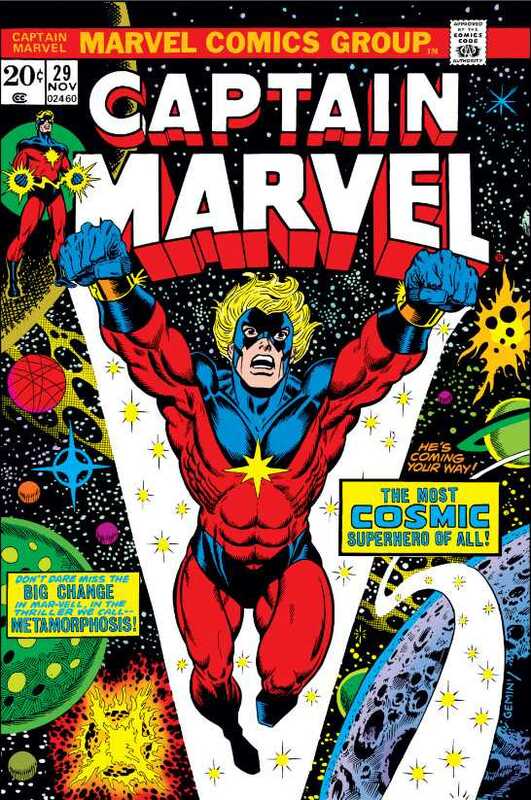 Captain Marvel issue 31 cover by Jim Starlin and Al Milgrom. Source. Captain Marvel issue 32 page by Jim Starlin and Dan Green. Source. This issue is basically a clean-up of Thanos’s invasion force which is a bit of a one-issue run of the mill story by Avengers standards. 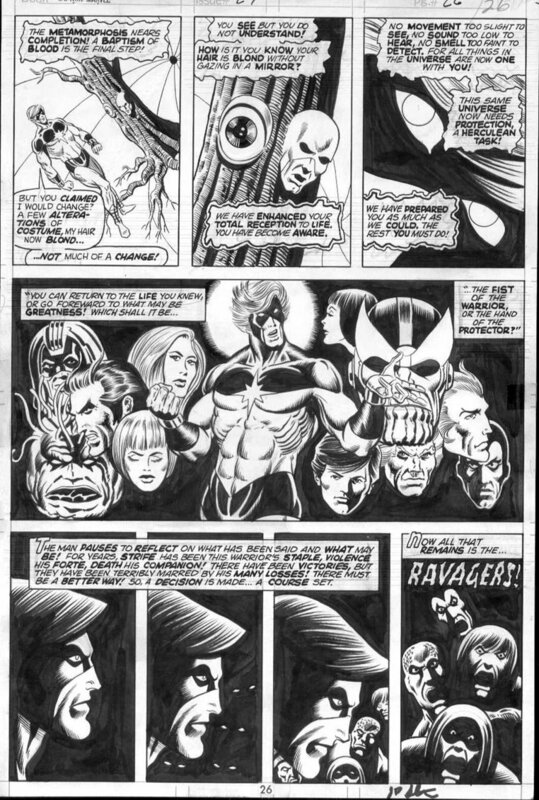 Written by Steve Englehart, and drawn by John Buscema. Really cool cover by Wilson/Romita. There is a re-cap of Captain Marvels plight prior to destruction of Thanos’s invasion fleet. Time to get back to the main event. Captain Marvel takes on Thanos and is crushed. 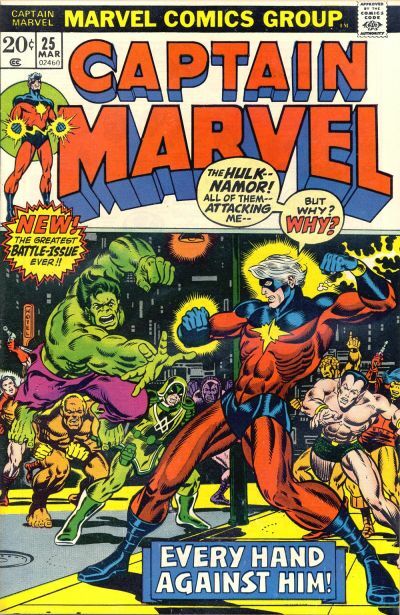 Before he kills Mar-vell he is distracted by the events that have just taken place in Avengers #125. He distracted the Avengers on purpose (hence the easy defeat) and he has effectively removed them from the battle by putting them one second out of phase with the rest of earth while they were in space. All of them save the Avenger Mantis who tells Captain Marvel what has happened. Just then there is another attack by Drax the Destroyer on Thanos, persistent guy that Drax! 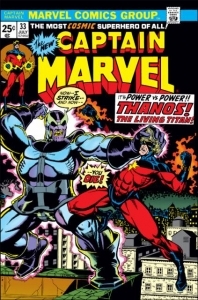 Captain Marvel joins in the battle and then leaves Drax to keep Thanos occupied. Captain Marvel, Mantis and the Titan computer Isaac have a plan to destroy the Cosmic Cube and Thanos along with it. The plan kind of works and Captain Marvel destroys the Cosmic Cube with a well-placed judo-chop. The hooded companion turns out to be the not so foxy anymore entity – Death. There is a long pause at the end of the book as this Thanos saga comes to an end. Captain Marvel issue 33 page 14 by Jim Starlin and Klaus Janson. Source. 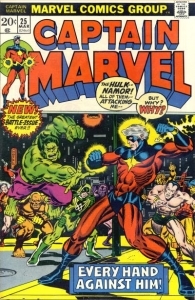 This issue features the final work by Jim Starlin on Captain Marvel. He introduces the lunatic character Nitro and a poisonous gas called compound thirteen. This compound is inhaled by Captain Marvell in his battle with Nitro, and would lead to the cancer that eventually kills him. Walt wrote an Undervalued Spotlight #80 on this book as well. Jim Starlin comes back to the character once more to write a touching end to this version of Captain Marvel in the graphic novel The Death of Captain Marvel in 1982. 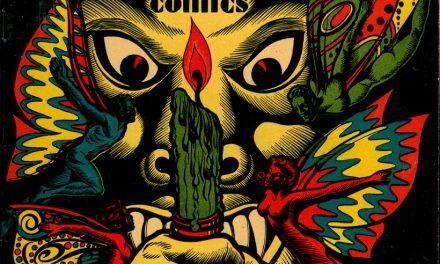 It is hard to imagine a comic shop existing without graphic novels and trades today, and the success of this novel helped pave the way for their acceptance. Jim Starlin would follow this series up with a new Warlock story that would re-define this character as well. It was a second cosmic story line and also featured Thanos and the Avengers, cementing their adversarial relationship. It was very strong beginning to a long and successful career in comics for Jim Starlin. One final note. 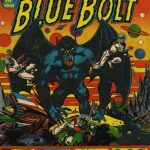 The villains “killed” in this book – The Super Skrull, The Controller, and the Blood Brothers – all made it back to the Marvel Universe intact to terrorize our super-heroes another day. I always like to end a story on a cheery note ^-^. 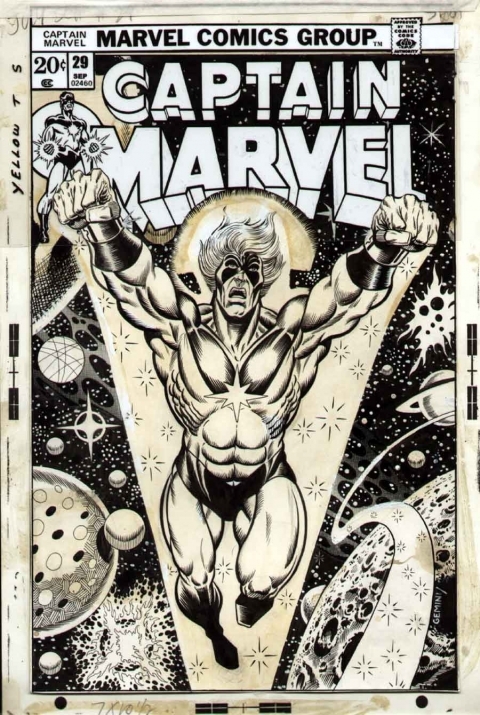 Captain Marvel issue 34 cover by Jim Starlin. Source. The 46th Overstreet Price guide values for the books covered today are listed below. Nuff Said! See you next month. What a beautiful choice. I love this Arc. 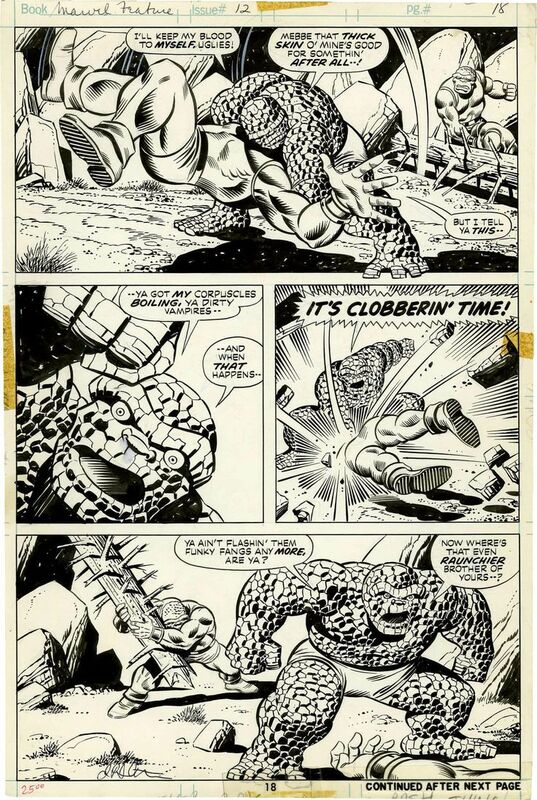 Darkseid was created a full 3 years before Thanos but I certainly don’t think Starlin copied Kirby. From what I read he was as big a fan of Kirby as the rest of us. I think Kirby influenced three generations of creators at least. I think its more like Superman and the original Capt Marvel. Inspired. I expect the Jimmy Olsen first panel appearance of Thanos to increase in price as the DC movie universe unfolds. I still say Hulk 180 is way undervalued as it too has first and only one panel introduction of the Wolverine. Any Thoughts? I certainly agree with you on the Hulk #180. If I continue writing UV Spotlights for Walt this is one book that will show up someday. Jim Starlin was a huge fan of both Jack Kirby and Steve Ditko. A pretty good pair to be influenced by. 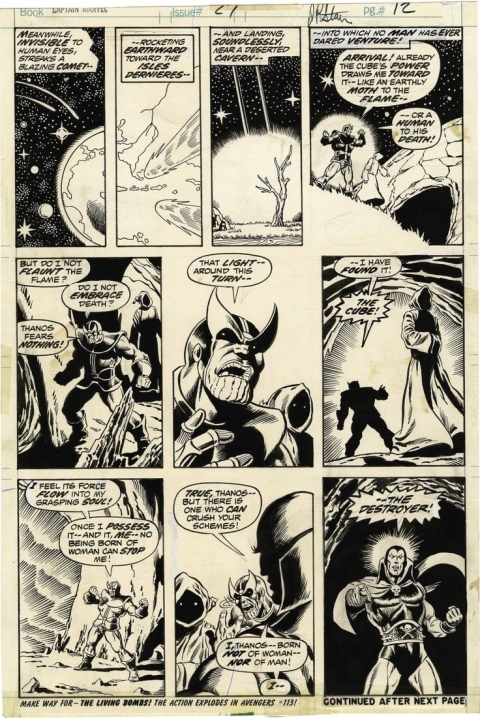 Jim Starlin sure took ownership of the Thanos character, bringing or following him to the pages of Warlock, the Silver Surfer, Iron Man and the Avengers, and points in between. Did he copy Jack Kirby’s Darkseid? I for one could not care less. I’m happy with character Thanos and what he has brought to the Marvel Universe in terms of anchoring epic story lines, and I can thank Jim Starlin for that. Thanks for the comment Dave! 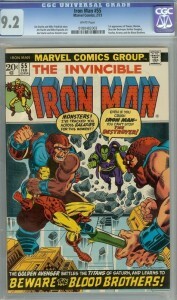 The Overvalued Iron Man #1? WTF? 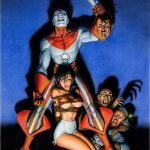 I view that book as grossly overpriced for its content by Overstreet…I don’t dispute that the book sells well at guide and has since the 80’s. 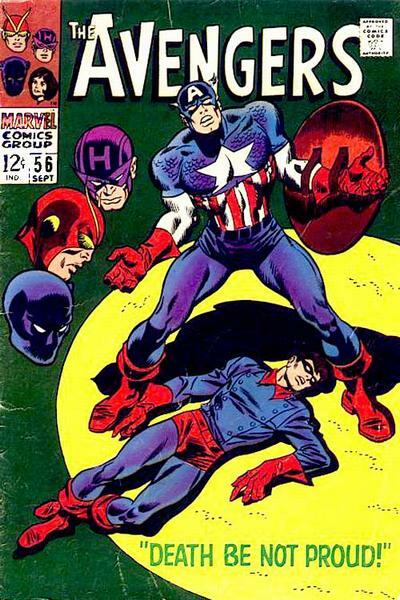 The content of the book is the last issue of Tales of Suspense. 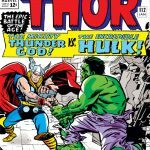 It does sport a iconic Gene Colan cover and has a #1 on the cover which helps it out immensely, but know way is it worth 9x the value of TOS #99. I wrote a column on this over in Overvalued Overstreet a while and I had many different opinions on this book, so I won’t feel too bad if you disagree Jack :). PS And I still own a copy of the book, because I needed the last story in Tales of Suspense ^-^. An opinion with no reasoning is the junk food of conversation… It’s all just empty calories. You’re right there Charlie. I don’t think “WTF” constitutes what I would called a reasoned and balanced argument under any circumstance, but I know Mike is pretty thick-skinned when it comes to differences of opinion.